I teach for a ministry called PRMI (Presbyterian Reformed Ministries International). I serve as their Missions Faculty for the Americas and have the joy of helping grow their work in Latin America. 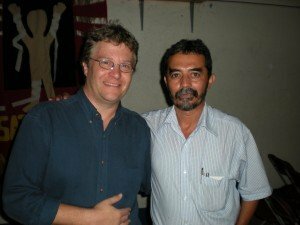 Pastor Raul (pictured with me a few years ago) is one of the host pastors. …pray in the Spirit on all occasions with all kinds of prayer and requests. With this in mind, be alert and always keep on praying for all the saints (Ephesians 6:18). We’ll be teaching a conference prayer, particularly the work of intercession. There are 5 Matagalpa churches that are on board as participants. The credibility of our work with Young Life Latin America over 10 years has opened up the doors for these churches to invite us in. There are at least 3 churches in Jinotega that will be sending people, building upon our first visit with them last November 2012. I look forward to telling you the stories of this trip. Sunday evening the 21st we will meet with the house church we have. Monday, 3:00am leave for the airport for flights home. Your prayers and financial gifts create the foundation for me to go. Several readers have bought my product out of the store, and others have given financially to help make this possible. I’m responsible for the $600 airfare and some incidentals to get there. This is spiritually challenging work and we need significant prayer covering. If you want to pray daily for me during the trip from April 16-22, I’d like you to contact me to be put on the intercessor’s list for this event. Make a donation to our support through PRMI, the ministry that covers us. Read more here. Or purchase something out of the store that you can use in your ministry. 100% of what is sold on this site supports our Latin American efforts.